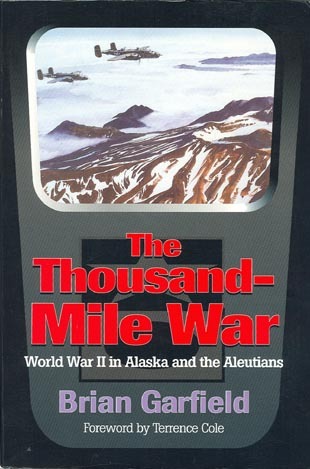 “The THOUSAND-MILE WAR” World War II in Alaska and the Aleutians. By Brian Garfield. Foreword by Terrence Cole. The Aleutian Islands were a frigid no-man’s land off the coast of Alaska, but to the Japanese in World War II, they were the key to victory over the United States. Still reeling from the devastation of Pearl Harbor, in December of 1941, the American’s were again caught off guard in June of 1942 and furiously assembled an incredible land, sea and air defense battling the Japanese. The war in the Aleutians was fought in some of the worst climatic conditions on earth! The book narrative follows the fifteen-month course of the Aleutians campaign chronologically, tracing the events that eventually combined to dash Japanese hopes of a quick victory while a surprised America was still floundering. Still the subject of debates, the World War II Aleutian campaign nevertheless marked an important turn of the war in favor of the US. 1995 Softbound edition. This book measures 9 by 6 inches. 456 pages, 120 black and white photos, 3 maps, and an index.